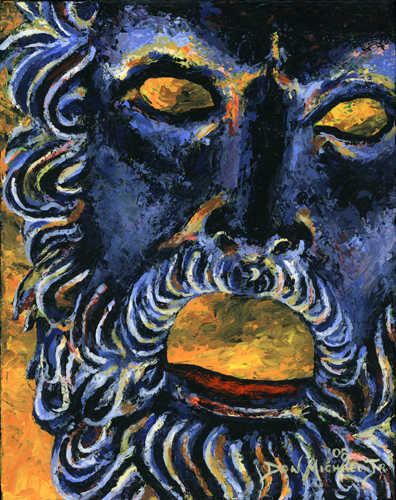 Zeus proved just as difficult to paint as he is as a Greek god. I wanted to create a stormy-looking sky and mask combo to accentuate this character’s tumultuous personality; but I never anticipated that “storminess” would translate to the creation process as well. I chose, once again, to use only my palette knife to render this work. However, I found that the swirls and lines in his beard and hair were not coming across the way I wanted. So, I got out a brush for the first time in several paintings. I really had to fight this painting thru to completion…and I’m still not sure I got exactly what I wanted. I’m still too close to it right now, but time will tell.